This electric fireplace will dress up your living room, bedroom or office! This fireplace can be moved into any room in your home or office. Just plug the fireplace in and you have a beautiful realistic looking fire! These fireplaces do not need to be fastened to the wall. The electric fireplace use halogen bulbs for the flame and light. The electric fireplace units are not LED. All electric fireplaces come with a remote control which allows you to operate with heat only, flame only or both heat and flame. 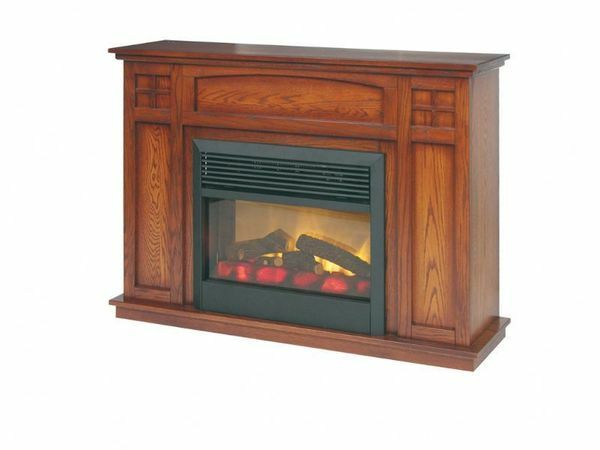 Electric fireplaces are much cheaper than oil or gas but they only produces 5000 btu of heat where a gas or oil would put out a good bit more. They are designed for easy installation and definitely produce enough heat to take the chill off! The British thermal unit (BTU or Btu) is a unit of energy used in the power, steam generation, heating and air conditioning industries. The term "BTU" is used to describe the heat value of fuels, and also to describe the power of heating and cooling systems, such as electric fireplaces. 100% Efficient Ratings – No heat going up a chimney! The Top Reason No Cleaning Up!